On August 7, early morning, I dreamed a dream that I met Dr. Ben Carson. In my dream, I prophesied in front of him that he would be the next president of the US. Then I told him "to email me when he's on the throne", meaning when he is in office. Last month, I made the photo of Dr. Carson my Facebook cover photo. Yesterday morning, I had another vivid and weird dream. Last night, I posted this dream on Facebook and asked for interpretation. Some people liked it, but no one said a thing. I decided to blog about this to document what I saw. In my dream, I was in a remote grassland beside a house made of cogon grass. My first cousin, Franco told me to help him dig up a pit to bury his deceased wife. But I didn't see the dead body of his wife and we were only two in that place. With shovels, we started digging the ground. My cousin told me not to make the burial pit wider because someone was recently buried next to the pit we are digging. As we dig, we exhumed two huge full plastic bags. One plastic bag in color white stinks so bad. we couldn't tell whether it's a dead body or just a garbage. We tossed it over aside. The other large plastic bag in black color is full of empty blue and beautiful bottles (lots of them). I said we can recycle those bottles. We set the plastic bag aside. My cousin left and I was left alone digging. All of a sudden, I discovered a large burial pit with water like a swimming pool and found myself standing at the edge of a 9x9 SQM burial pit. The coffin that looks like either glass or a transparent plastic lies at the other end of this pit. Suddenly it hit me; the man in the coffin was Ferdinand E. Marcos, the late president of the Philippines. I could see half of his body (waist to head ) in white barong tagalog, even if the coffin was at the other end of the pit, about 9 meters away from where I stood. The pit was filled up with water and a white plastic was placed underneath to hold the water from draining. I punctured the plastic on one side of the grave and the water gushed out. Then I realized, maybe they are trying to preserve the body with this water, so I tried to cover the whole I just puncture. In my dream, the scene was suddenly changed. The burial we just discovered became known to many. But don't know what happened to the body. I found myself telling to others that we should take a video to document what we have found. Then I began to talk to some people and say, "how were the people able to bring an empty coffin back home in the plane without being someone noticing that it's empty. " I began to act out and said, "So the people were carrying the coffin like this pretending there's body but it's actually empty? Is the son of the late president really that powerful that people are afraid to tell the truth about the empty coffin? How could the coffin exit the airport without being discovered? " Then another scene appeared. The discovery of the body is already being broadcasted in the TV news by the abs-cbn. The reporter said, "We are keeping the identity of those who found the body confidential for safety and security of their children and family!". While watching the news, I said, that's good. Then I woke up! This is the one I saw in my dream, except I didn't see the red sash ribbon. I wasn't particularly interested what's written and being advocated in this photo, I was glued to the lying body itself and what I saw in my dream. Honestly, prior to this, I haven't seen any photo of the late President's corpse inside a glass coffin. I heard about it years ago, but haven't seen any picture. Then it hit me. My dream about Marcos being buried secretly somewhere does not make sense because his cadaver is encased in a glass coffin and lies in a mausoleum in Batac Ilocos Norte. I kept thinking about it and what my dream meant. 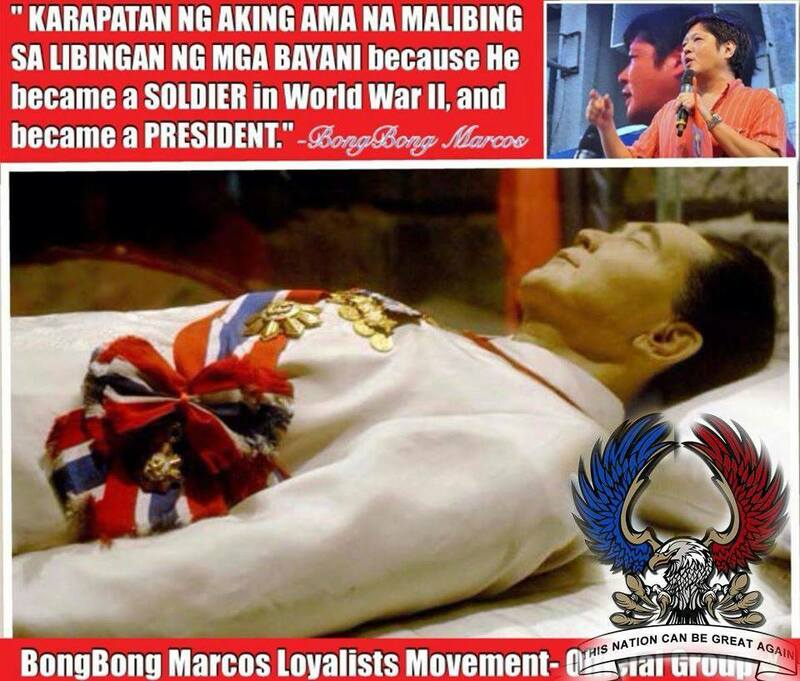 Because I still couldn't go back to sleep, I goggled "Marcos in a glass coffin." Immediately, the photo of Imelda beside the glass coffin of Marcos appeared. Then I read what the Wikipedia say about Marcos. I went straight down to the topic Mausoleum from Past to Present. The last sentence of the last paragraph was shocking to me. It reads, "The family's mortician confirmed that the corpse is real, although people suspect it is a wax replica, and the real body was secretly buried in ground." Wow! That's the first time I read something like that. Really? I was speechless. Not that I believe this suspicion, but could it be that my dream about his body being buried secretly in the ground is true? Why would I ever dream something like this? I wasn't thinking about him, nor I was reading lately about this.